J Metric conducted a survey of 176 Ecommerce retailers and 18 million customers to uncover insights on how Ecommerce customers behave. 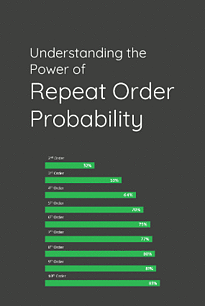 The survey found that after a customer has placed an initial order, that same customer has a 32% chance of returning to your store to place a nother order. If that same customer comes back to make a second purchase, there is 54% they will place another purchase!